I've uploaded a bunch of photos of today's events on Flickr. 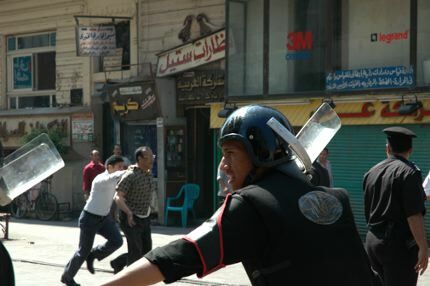 Follow the slide show in order and you'll a story of how today's demos unfolded, although there were bigger ones (and more violence) in Abbassiya and Midan Talaat Harb that I did not see. 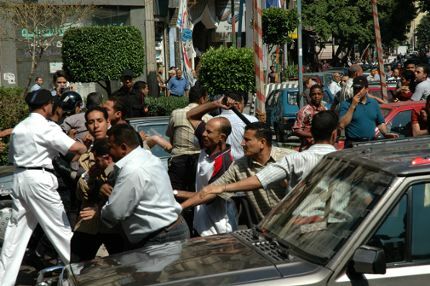 1: Riot police and baltaguia attack protesters on Alfi Bey St.
2: Police and baltaguia gang up to beat a protester. 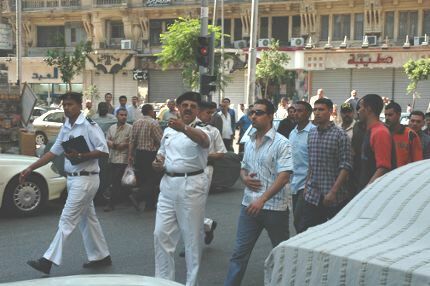 3: Police officer points out protesters to attack for baltaguia and orders them to attack. Hopefully more comment later, as I am swamped, but a picture is worth a thousand words.